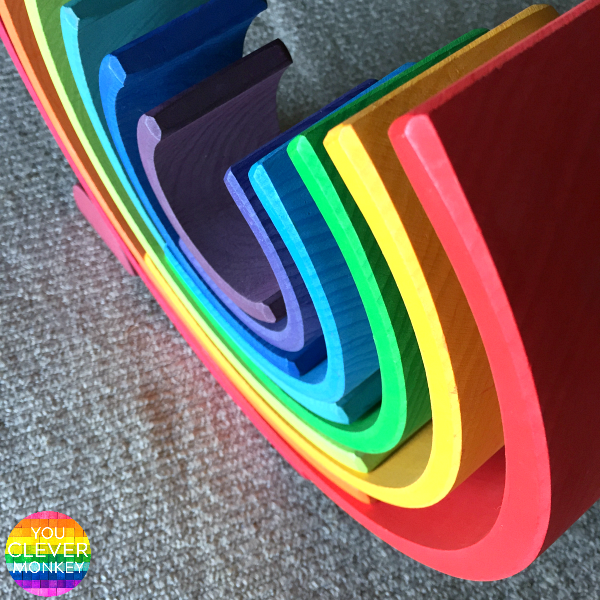 Eight different ways to play with a Grimms Wooden Rainbow Stacker toy from encouraging your child's imaginative play to promoting STEM and early Math skills and building your childs spatial awareness and fine motor skills, you'll be amazed at the many ways you can play with this one toy! 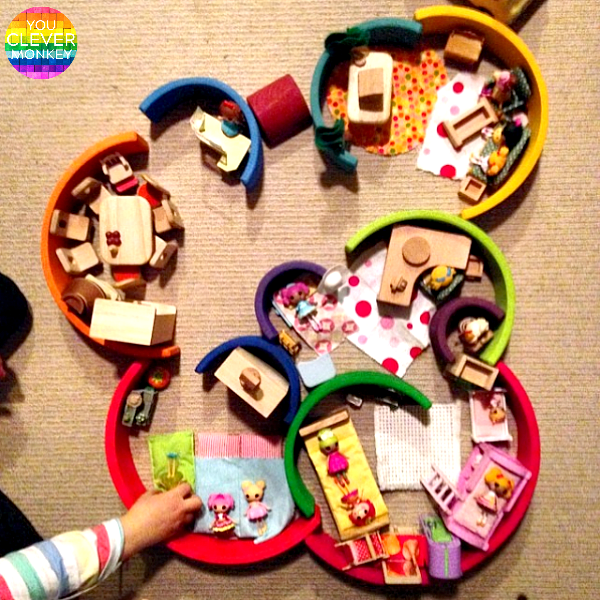 Last week I shared a photo on Instagram of the house my youngest child had made with her wooden stacking rainbow. 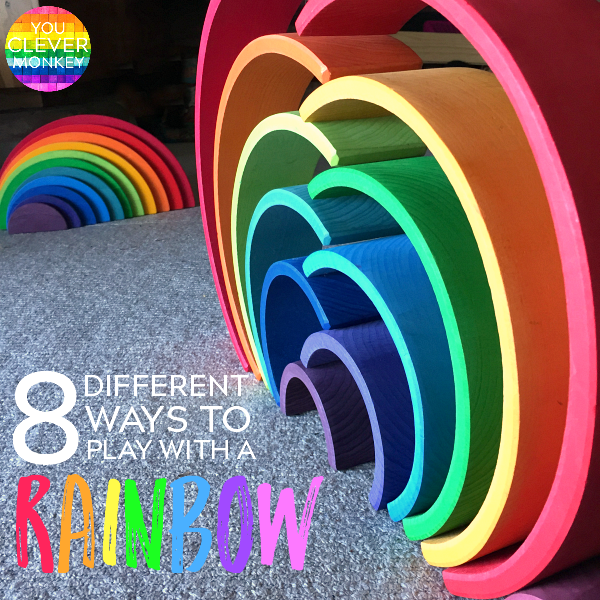 She often uses the rainbow like this I'm not surprised to see this scene on the lounge room floor but the photo attracted quite a few comments which made me think it was worth sharing some of the different ways we play with our wooden rainbow here on the blog. 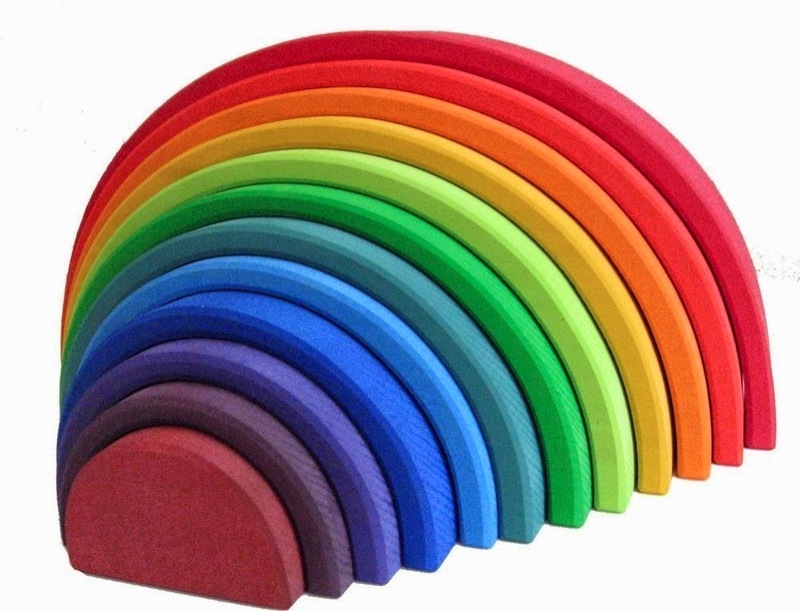 We haven't had our stacking rainbow very long. It was one thing I'd looked at for the longest time then looked at the price and kept telling myself that we didn't really need one. 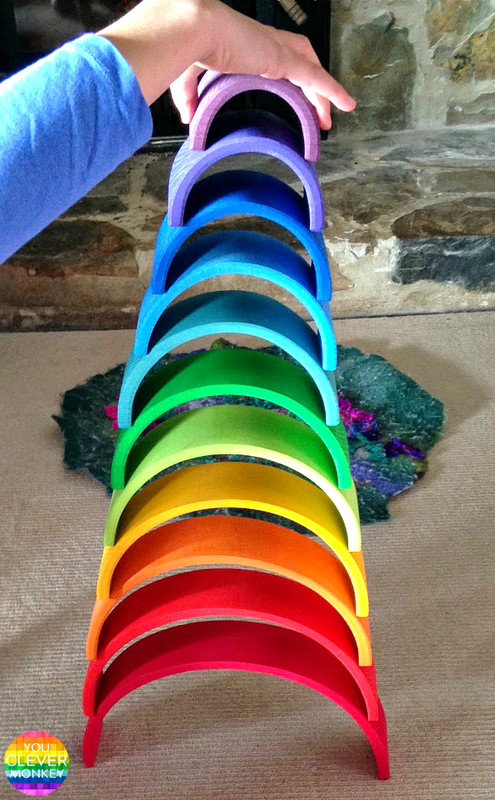 My eldest child is ten years old and it took me nearly as long to purchase a Grimm's Wooden Stacking Rainbow for our house. 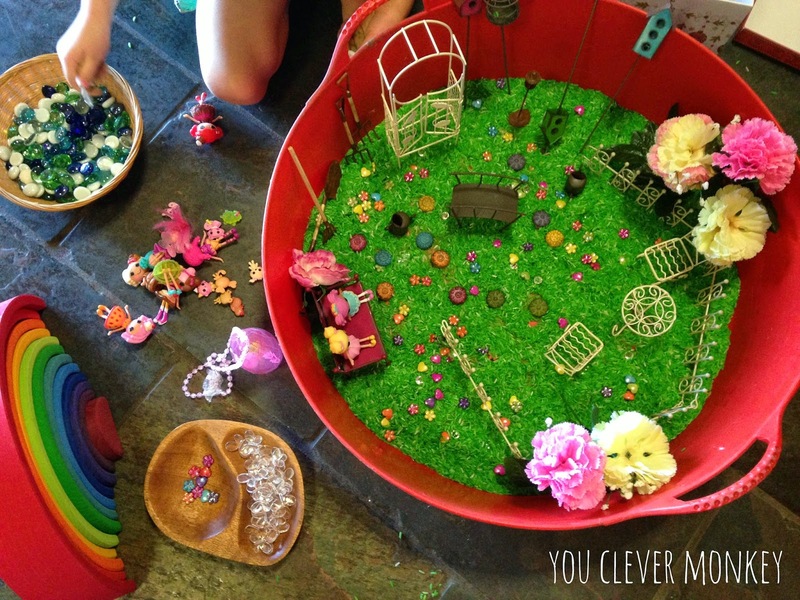 Before last Christmas I had a it's-now-or-never moment, my youngest was four and soon enough their wish to fill the lounge room floor with their play will have gone. So I got one, for not too bad a price from Amazon, and have not regretted it at all. 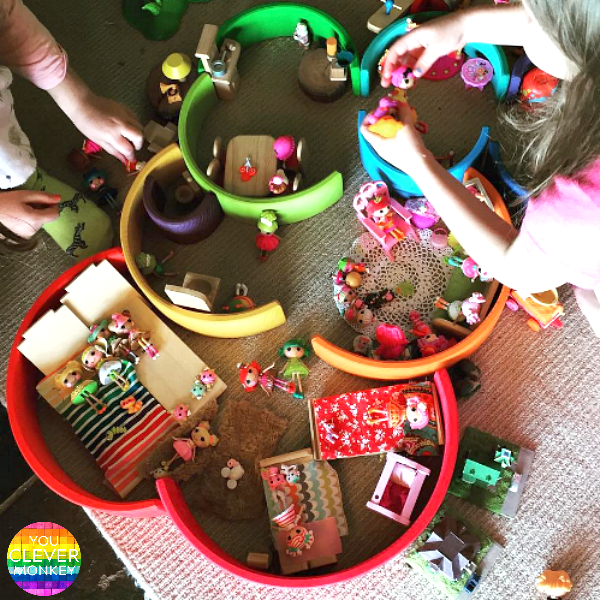 Our rainbow stacker is often used in small world play. 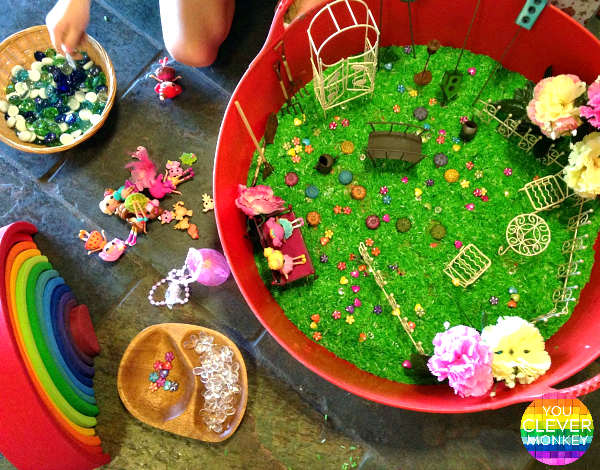 You can see it being used here as part of an invitation to play I had set up in our kitchen last summer. Sometimes it's just used in the background. While other times, it's right in the middle of things. I've also used it in the classroom to invite pretend play. 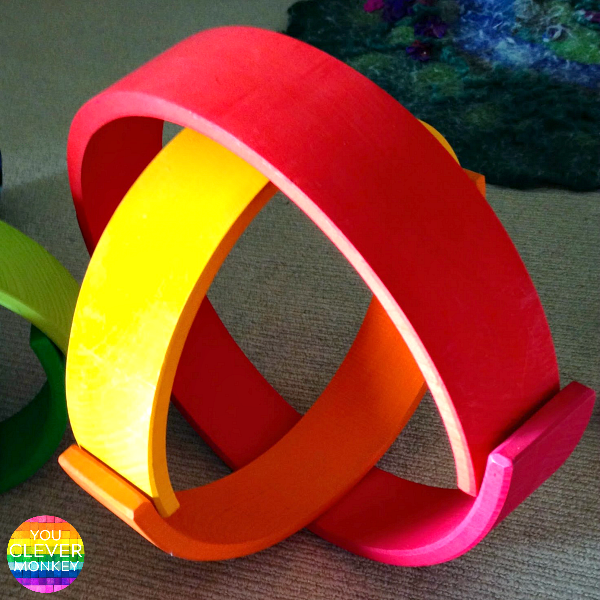 One Perfect Day explored shapes and symmetry with this lovely invitation their rainbow stacker. It was enough to make me go and get a cheap mirror to play with at our house! Look at that reflection! 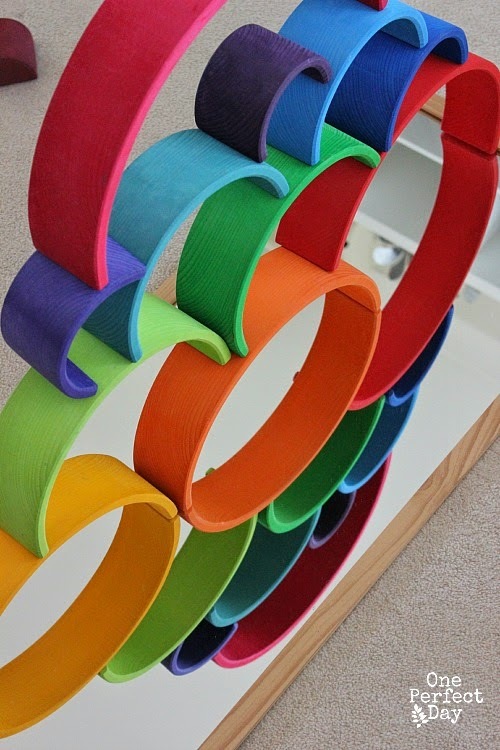 A perfect way to explore shape and symmetry through play. 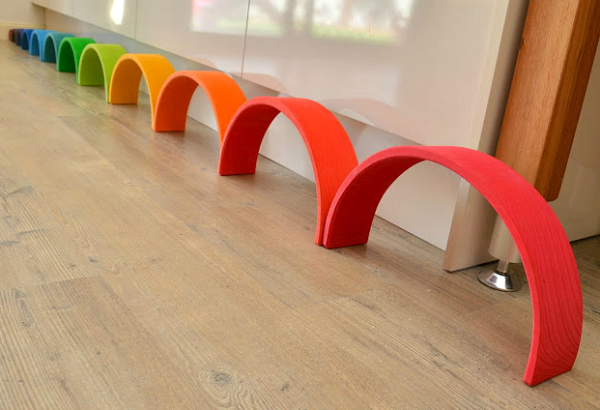 Or add it to your other blocks and you will be amazed at how children will incorporate it in their play! 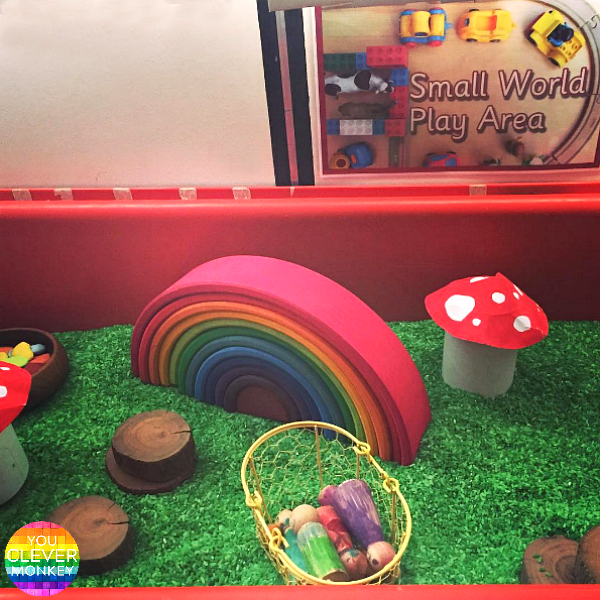 Grimms have created a piece of art itself with their wooden rainbow stacker but they can also be used to create other artwork. We used ours to make some experimental sculptures which is harder than it first seems. 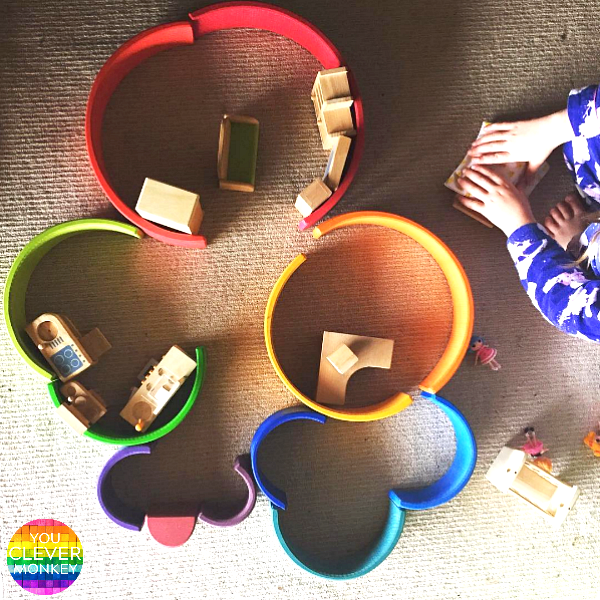 It's a fantastic way to build hand-eye co-ordination and spatial awareness skills as you have to find the 'right' spot to balance your next piece otherwise the whole structure falls apart. 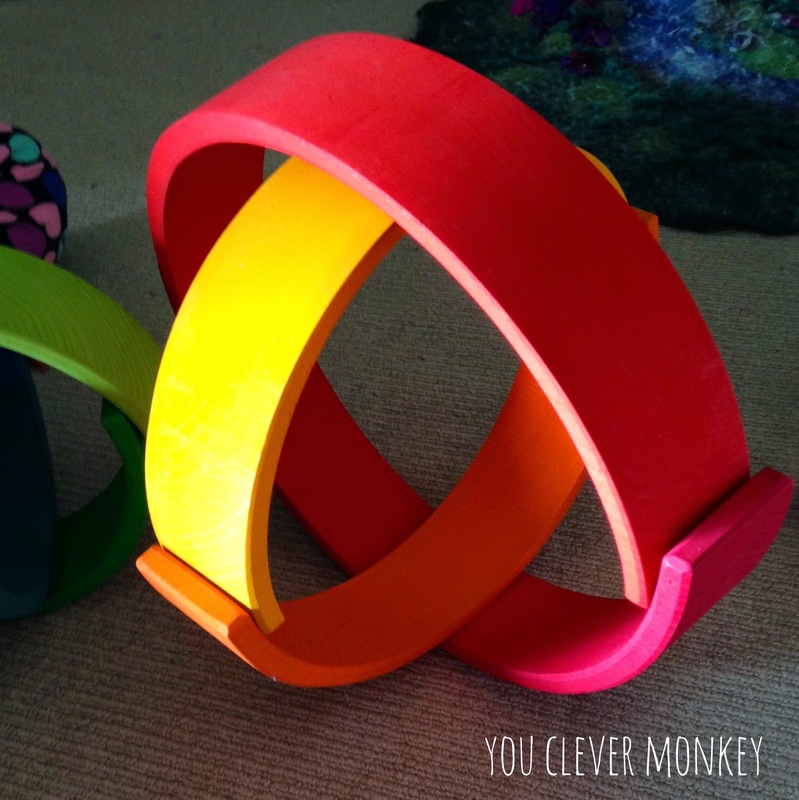 We've already mentioned using your rainbow stacker to explore symmetry but it can be used to explore other mathematical concepts too. A couple of times we've used our rainbow to help us sort things practicing our early maths skills. 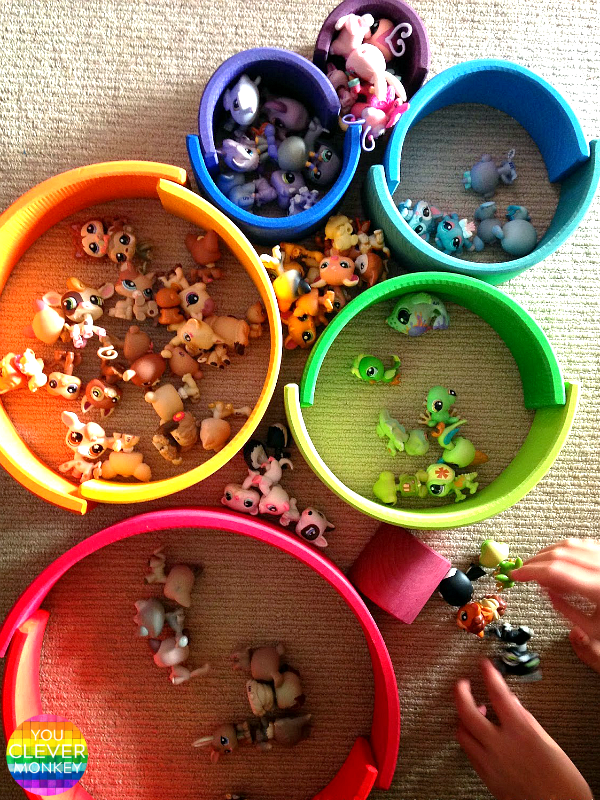 Obviously sorting and ordering it by size and shape is one of it's innate benefits. Here we used our rainbow to help us sort by colour. Another time, our Schleich animals were sorted by continent by my oldest two after looking at a picture atlas we have at home. 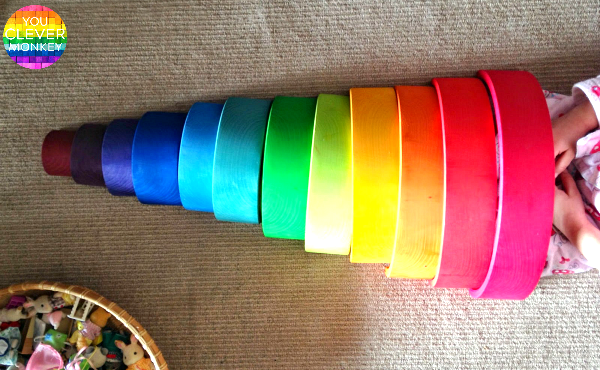 Lauren over at Teacher Types used their rainbow to measure things and use it to order the arcs from smallest to largest. 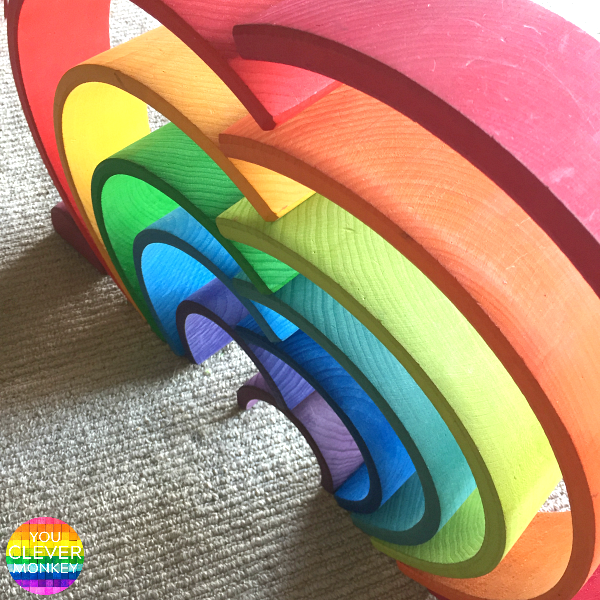 Challenge your child to explore force and motion with your rainbow stacker by creating a marble run or two. There are some amazing examples of this captured on YouTube. 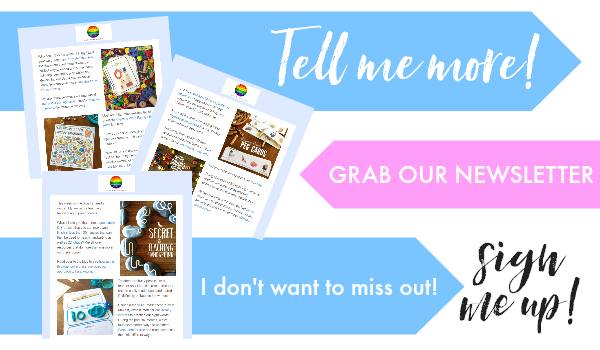 Here are three of our favourites for you to try at home or in the classroom. What's that about leaving the best to last? 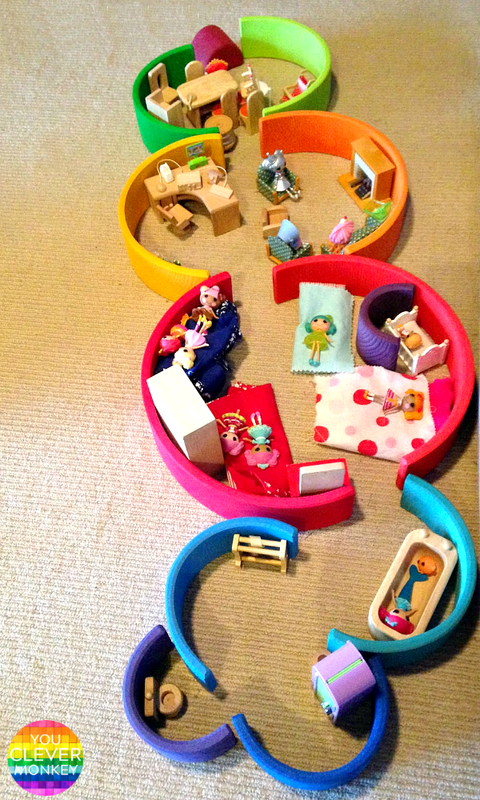 Well this is one most favourite way of all to play with our Grimms rainbow stacker - to turn it into a dolls house! 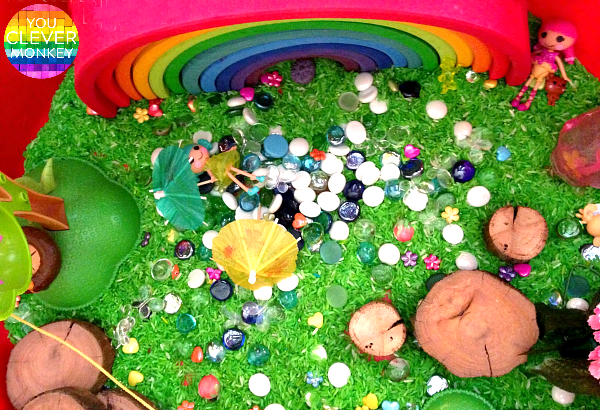 My then four year old created her own house with our rainbow after being frustrated that her sisters wouldn't include her in their play with our more traditional dolls house and she's been making them ever since. 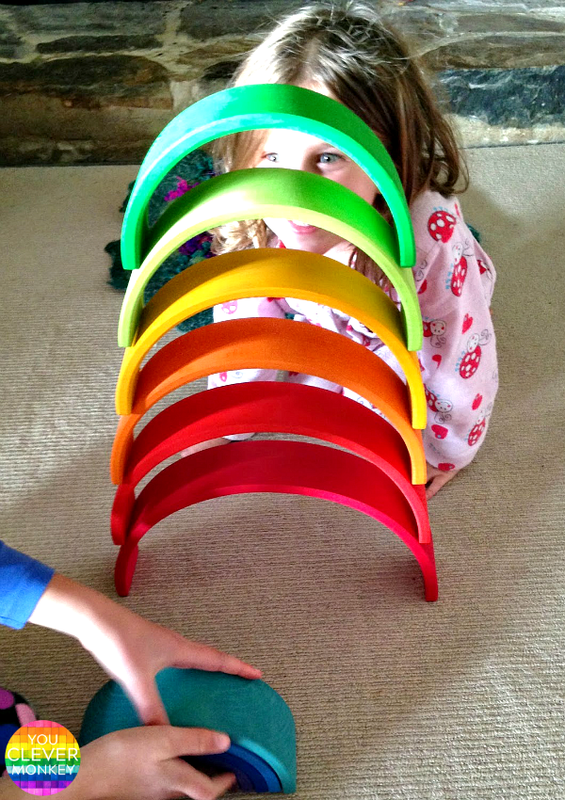 Tell us your favourite way to play with your stacking rainbow! We'd love to hear your ideas.